My name is Jamie Kemen. I’m a wife to my handsome husband, Ted and a mom to two little men, Tommy & Trevor. I currently work in the home raising our boys and supporting my husband, and sell Jamberry nail-wraps for fun on the side. I love to cook, entertain, make friends, travel, and CrossFit. WHAT BROUGHT YOU TO GREEN BAY, WI? I’m from a suburb of Chicago, but met my husband Ted in the Twin Cities while attending Bethel University. He took a job in Green Bay before he proposed, so when I said “yes” to him, I said “yes” to Green Bay, too. I think it’s an awesome place to raise a family! Before joining crossfit in 2011, I had been sick with the autoimmune disease Systemic Lupus Erythematosus (SLE) for 20 years. My Lupus affects my joints, central nervous system, and renal function. I saw 2-3 specialists twice a year and was on 5 different prescriptions to manage arthritic pain, partial complex seizures & high blood pressure. In 2006, I became deathly ill during our first pregnancy and we lost our daughter to stillbirth at 27 weeks gestation. In 2007, while pregnant with our oldest, I was also very ill and remained on bed-rest for ⅔ of my pregnancy. I gained 70 lbs. during that pregnancy! 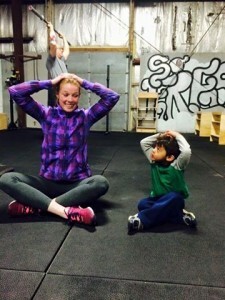 Tommy was born 6 weeks early, but is healthy and loves crossfit as much as his mom & dad. I lost most of that weight before starting on-ramp, but as Grant would say, “I was skinny-fat.” I had no muscle definition, ate a ton of the baked yummies I loved to make, and stayed around 130 lbs. by going to step-class or Zumba at the local family gym three times per week. First and foremost, the encouragement to change my diet has provided a way for me to take charge of my own health and I’ve been able to get off of one long-term medication, and decrease at least two others simply by limiting grains and cutting out sugar. I feel like I have changed from a young adolescent stuck with an unfortunate chronic diagnosis into someone who cares deeply about her own health and is taking active steps to feel better. Almost my entire life, I have been labeled as “unhealthy,” but now I feel like I’m one of the healthiest people I know, even with a chronic auto-immune illness. Beyond the Lupus, though, I feel like I have made great progress as an athlete. I may never “enjoy” running, but I know that if I need to, I can run 5K without trouble. I will never compete as a games athlete, but I am stronger than I ever have been, and I am proud of the time and work I have put in to accomplish the goals I have. I know that this hard work will continue to pay off as my disease progresses or on days when my arthritis flares. HOW WAS YOUR ON-RAMP EXPERIENCE? WHAT PERSONAL BENEFIT DID YOU RECEIVE FROM ON-RAMP? On-ramp was scary, but fun. Just like regular WODs are to me now. I felt ill-prepared at first, unsure if I could complete any task given to me, but felt cheered-on by my coach when I was discouraged. The diet switch was a battle for me; I had been trying to convince Ted for three months that it was stupid and unnecessary for quality health, and I tried making those same arguments to my coach. But, in the end, I agreed to try it strict for 30 days, and that truly changed the course of my life. My body went through so many physical and hormonal changes in those 30 days, I knew this crossfit/paleo thing had to be doing something to my system and indeed it was. WHAT WAS IT LIKE TO JOIN THE REGULAR CLASSES? WAS IT EXCITING/SCARY/ETC.? Extremely scary and intimidating! Only until I began to talk to the athletes in my class and get to know them and their own stories. Each crossfitter is there for some similar reason, and we all have a common dislike for burpees! The crossfit community is not intimidating at all; in reality, they are some of the most encouraging and uplifting people you will find, especially on a hard day. I love the variety of movement at Crossfit. I had been doing step-class for years, and the only thing that ever became physically stronger were my calves. I love knowing while I’m at Crossfit I’m working my whole body, different muscle groups, focusing on strength and cardiovascular exercises all at once. First and foremost, the coaching. Their attention to detail is crucial in helping CFGB athletes perform and achieve goals while remaining healthy and uninjured. Secondly, it’s the community of people who are there for one another when times are good (moving, new babies, weddings, etc.) and when they’re really hard (death of parents, friends, divorce, etc.). Our family has seen and felt this personally and we are thankful that in addition to our Church family, we have an amazing community of friends at Crossfit Green Bay. WHAT WOULD YOU SAY TO THOSE WHO FEEL LIKE THEY’RE NOT IN GOOD ENOUGH SHAPE TO TRY CROSSFIT? OR ARE AFRAID OF INJURY? If I can do it, you can at least try to do it. You don’t have to be “in shape” to get started at Crossfit. If you think that the only people who Crossfit are bodybuilding, marathoning super-athletes, then step into a random WOD sometime and you’ll see that you’re mistaken. We have some of those super-athletes at Crossfit Green Bay, but 85% of us are not them. And regarding injury, if anyone should be afraid of injury it should be this girl. I know what it feels like to have my hips, elbows, hands, shoulders and ankles inflamed and painful due ot rheumatism. If I thought I was putting myself at greater risk by learning how to do functional movements more efficiently at Crossfit, I would have quit long ago. The other thing I would tell you, is that all the movements we do at Crossfit are scaleable. If you have a good reason why you don’t feel comfortable doing something specific, don’t do it (ahem, box-jumps). Your coaches want you to to be healthy and uninjured as much as you do! My goal is to eat a clean diet 80/20, show up 3x+/week, and crush my 200# BS. Butterfly pull-ups, one-handed handstand, and some sort of race in 2015 are some other ones in the back of my mind. WHAT IS YOUR FAVORITE CROSSFIT EXERCISE? WHAT IS YOUR LEAST FAVORITE?